Secretary-General Ban Ki-moon with President Evo Morales in El Torno Municipality, Bolivia. 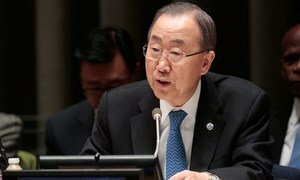 Addressing the bloc of developing countries known as the Group of 77 (G77) and China, Secretary-General Ban Ki-moon is today expected to urge world leaders to work together to reduce poverty and inequality, while balancing the needs of the environment and addressing climate change. Mr. Ban arrived yesterday in the Bolivian city of Santa Cruz for the G77 Summit which over two days will gather heads of state and government representatives from more than 130 member countries under the theme, “New World Order for Living Well”. “We need a strong partnership between the G77 and China and the rest of the UN Member States,” the UN chief told the press. This year's summit comes amidst the 1,000 days of accelerated actions to reach the anti-poverty targets known as the Millennium Development Goals (MDGs) and as the international community is working on a post-2015 sustainable development agenda to replace them. Mr. Ban stressed that a new development agenda must be based on human-rights and the rule of law, and in line with the UN Charter. This is also the last year before world leaders meet to hammer out a legally-binding treaty to be adopted in 2015, and enter force by 2020, which would cut climate-altering greenhouse gas emissions. Ahead of these discussions, Mr. Ban will convene a climate summit in September this year when world leaders gather at UN Headquarters for the annual General Assembly meeting. “In all of these I need the strong leadership of President Evo Morales as chair of the G77 and China,” said Mr. Ban. “By working together in one direction we can all know buen vivir,” he added using the Spanish-language term which translates to “living well” and has indigenous roots. The G77, which marks its 50th anniversary this year, was established in 1964 by 77 States. It now includes more than 130 countries, some two-thirds of the UN membership, and over 60 per cent of the world's population. As part of festivities yesterday marking Mr. Ban's visit to Bolivia, he was presented with a birthday cake in honour of his 70th birthday. On the margins of today's summit, Mr. Ban met with the First Vice President of Iran, Eshaq Jahangiri, to discuss development issues, as well as the potential role that Iran could play in restoring stability in Iraq and Syria. The Secretary-General added that he looked forward to Iran's positive involvement on climate change and said he very much hoped that President Hassan Rouhani would attend the climate summit this September. According to a UN spokesperson, the two leaders also discussed the Iranian nuclear issue. Mr. Ban expressed hope that the parties could show sufficient flexibility to meet the 20 July deadline agreed on between Tehran and several Member States. A new global new development agenda based on human rights and the rule of law is the surest pathway to balancing the needs of people and the planet, while eradicating extreme poverty and closing socio-economic gaps, senior United Nations officials said today.